My little chunk is now weighing 21lb and is still measuring 31 inches, she's getting very tall and can even climb onto the side board units normally so she can get her hands on the sideboard unit, the little monkey. 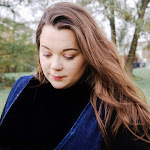 We need to get some more baby gros because she is growing at such a fast rate and I am sad to say that she has finally grown out of that beautiful navy dress turned t-shirt that I love so much. Another growth spurt required another shopping spree but there are so many adorable outfits for Autumn/Winter and I cannot resist them. My daughter is a size three in shoes but they are so hard to find but I managed to get some of the most cutest dusty pink ones from Tesco for £10! Even though my daughter is never been really much of an eater, because she prefers to snack on food rather than sit for a big meal, she certainly got an appetite this month. Some of her favourite snacks are of course grapes and bread sticks, who doesn't love a bread stick? We have had to move the fruit bowl because she loves to help herself making it harder for me to keep track of what fruit she is eating, as I don't really want her having too many grapes being full of sugar. Each month we like to try and new food in the house and this month we all have been enjoying some long green beans and swede and my daughter loves the both which doesn't surprise me as she loves her vegetables. Little lady is still having two cups of milk a day - one in the morning and one for night time. However this week on the food shop we got some Horlicks for a special treat and she loves the stuff, again because of the sugar we still try to limit hot drinks to every so often. This month we have seen a real change in her behaviour. She has been super loving and enjoys cuddles and kisses with everyone, she loves to show her toys how much they mean to her as she squeezes and says 'ahhh'. However at our Rhyme Time session at the community centre she needed to understand that not every child likes a cuddle. A little girl had a flower on her top and my daughter being inquisitive decided to go and investigate, which took her by surprise but little lady persisted. Then all of a sudden my daughter tried pulling the flower and the little girl fell over onto another child, and then that child fell onto another completely embarrassing. So embarrassing that we left soon after. Like with most thing with my daughter, despite the cuteness and loving side, she also has a mischievous and naughty side. The temper tantrums are crazy at the moment, it's beginning to get quite hard to know how to deal with them I must admit. Especially when we are in public, as I can't help but think every one is staring at me. Going out to eat at restaurants is quite testing, she scream and cries when she wants something and I end up trying to find anything that may distract her from the tantrum, but it's another learning curve. Sleep? What is that? Well that's what I have been thinking to myself this month. Now normally she sleep about eight hours a night but as she is going through separation anxiety this has been completely thrown up in the air. It is becoming easier each night and I think she is beginning to understand that I will go back to her. This month we have also seen a drop in the length of naps as you can imagine we have had a few grumpy afternoons because she can be stubborn, but I would prefer it if she did nap in the afternoon. (So I can snoozed too, haha no I mean do the laundry or something). During the night she does seem to be waking several times a night and I think its due to these teeth trying to break through, I do feel as if I have a new born baby again but I am loving those extra cuddles with her. She actually hates her cot! Like literally. Every single time I try to put her down for a nap or try to settle her for bedtime she screams the house down, so the a controlled crying method is something that we have been trying to use with her this month. It's absolute torture to hear her get so upset, but if I did let her come into our room all the time I feel as if it will become too much of a habit. Slowly but surely I think she is beginning to understand that she can't have it her own way, she settles down after about ten minutes of crying. My little chatterbox is saying a few more words this month but her favourite word has to be ta and sometimes she will not give me anything I ask for until I say 'ta'. It's so sweet. Oh my goodness she has also started to snort whilst Peppa Pig is on the box and I must admit it's pretty darn cute. I am also finding that she seems to be able to recall some information with pictures, colours, and people. She really likes our big cat magnet on the fridge and I will always ask you where the cat's eyes are and she knows exactly where to point. When we sing wheels on the bus and for the bell/ding she will tap her nose. Catch my Daughter's previous update? 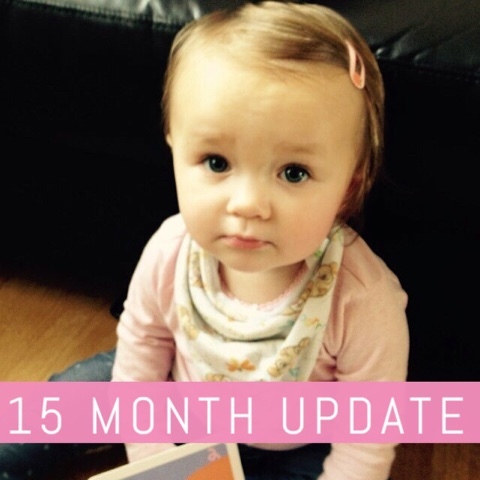 4 comments on "Amelia's 15 Month Update"
Thank you Nigel and Thank you for hosting this week! See you next Friday.